The Indian auto industry is one of the largest automotive industries across the globe and the second largest two-wheeler manufacturer. The Indian automotive industry accounts for more than 8% of the country’s GDP. The three-wheeler segment is the second fastest growing industry after two-wheeler. Moreover, three wheeler manufacturers in India are growing interest in exploring the rural markets, which further aided the three wheelers market growth in India. In 2018, it is expected that three wheelers market is anticipated to witness gradual pickup in demand as the effect of demonetization and GST begins to moderate. Moreover, significant exports of three-wheeler to neighboring countries such as Sri Lanka and Bangladesh remain the major growth driver for the industry owing to rising disposable income, improving road infrastructure and increasing demand for motorized transportation. Goldstein Research analyst forecast the three wheeler market in India to grow at a CAGR of 5.2% during the period 2016-2024. Moreover, Indian three-wheeler sales reached to 511,658 units in FY 2016-17. Further, the three wheelers market is likely to reach USD 6.01 billion by the end of the forecast period, owing to growing market in rural areas. Geographically, Tier-II cities accounted for the highest revenue share of three wheelers as the major sales of e-rickshaw and CNG powered three wheelers are growing significantly in Tier-II cities. Tier-III cities are the most opportunistic and fastest growing markets and are expected to dominate the market in coming years. On the basis of vehicle type, passenger three wheelers accounted for the largest revenue share as more than 80% three-wheeler sold in India are passenger carriers and only one fifth are goods carriers. Moreover, passenger three wheelers are likely to maintain their dominance over the forecast period owing to growing sales in Tier-II and Tier-III cities. According to our India three wheelers market study on the basis of extensive primary and secondary research, one of the major trend that driving the growth of three wheelers market is the up-gradation of three wheelers. Three wheeler passenger carriers are expected to benefit from product up-gradations such as 2-stroke to 4-stroke and petrol/diesel to CNG as well as from the fresh permit opening by different state governments. According to the report, a major driver in Indian three wheelers market is the rising population and growing need for affordable and convenient transportation in Tier-II and Tier-III is fuelling the market for passenger and goods carrier three wheelers in India. Further, the report states that one challenge in India three wheelers market is the emergence of electric three wheelers. Electric three-wheeler can be the major challenge for the market players who will delay in adopting this emerging technology as the Indian government is aiming for electrification of its major part of the automotive industry by 2030. The report covers the present ground scenario and the future growth prospects of the India three wheelers market for 2016-2024 along with the total sales of three-wheeler in every region. We calculated the market size and revenue share on the basis of revenue generated from the sales of three-wheeler by various industry players across India. 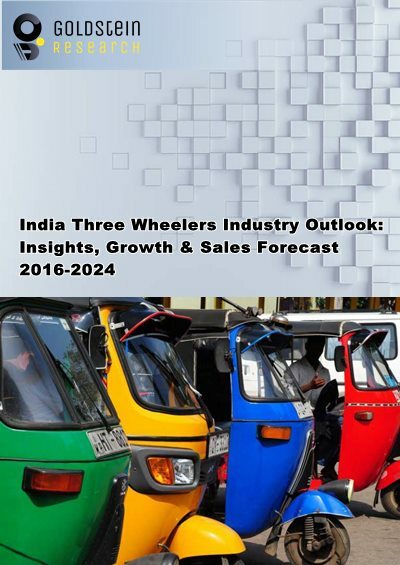 Report on three wheelers market in India has been prepared based on an in-depth market analysis from industry experts. The report covers the competitive landscape and current position of major players in the India three wheelers market. The report also includes Porter's five force model, SWOT analysis, company profiling, business strategies of market players and their business models. India three wheelers market report also recognizes value chain analysis to understand the cost differentiation to provide a competitive advantage to the existing and new entry players. Our India three wheelers market report comprises of the following companies as the key players in the India three wheelers market: Bajaj Auto, Piaggio Vehicles, Mahindra & Mahindra, Scoter India, Atul Auto and TVS Motor Company. What are the total sales in 2015-16 (Units) and what would be the expected demand over the forecast period?